You are out if you still do not heard of the latest portable device—Lenovo Yoga Tablet 2(Pro)! That’s indeed the big news which can bring us the nice enjoyment for favorite movies, right? To enjoy any videos on this new Lenovo Yoga Tablet 2, we are offering the best way to play videos smoothly on Lenovo Yoga Tablet2 without any troubles. Part 1.Lenovo Yoga Tablet2—Bigger screen tablet is coming! As phones keep getting bigger, 8-inch tablets are quickly becoming the sweet spot for shoppers. And Lenovo’s Yoga Tablet 2 is one of the best slates you can buy. This device boasts an improved kickstand design and houses a long-lasting battery in its cylindrical side. For seeking the better enjoyment of watching movies on Lenovo Yoga Tablet 2, how to make all video formats friendly with Yoga Tablet2 has become the top issues online. Any good suggestions there to play videos nicely on Lenovo Yoga? Supported Videos: H.263 MPEG-4/3GPP, H.264 AVC MPEG-4(MP4), MPEG-TS, 3GPP, MPEG-4 SP 3GPP, VP8 WebM, MKV, etc. Supported Audio formats: MP3, 3GP, MP4, M4A, AAC, WAV, TS, FLAC, OGG, MID, XMF, MXMF, RTTTL, RTX, OTA, IMY. Supported Image formats: JPG, GIF, PNG, BMP, WEBP. As usual, it would be much easier to add our suitable videos to Yoga tablet on computer. Just connect the tablet to PC with USB cable, when the main interface pops up there, we are going to click the ‘Add media’ or ‘Add files’ to load them in freely. Due to the supported video information we mentioned above, we just need to wait for a moment through the third-party assistant tools. How could we import those incompatible video files to Lenovo Yoga Tablet 2 for playback? That may be the top point as soon as we wanna watch the recordings which took by ourselves. The easiest way to transfer them freely to Yoga tablet is transcoding the formats there. Fortunately, Pavtube studio has the professional Lenovo Yoga Tablet 2 converter for us to enjoy any movies without any troubles. Specific steps are allowed here which are deserved for us to have a try. Step 1. Open the main interface and with the ‘Add files’ we can easily load the original files in. Or directly drag the files in is also a good idea! Step 2. Choose the best output for Yoga tablet. Come to the output list by clicking the ‘Format’ bar there. Drop the list down, here we suggest you to select the ‘HD Video’>>’H.264 HD Video(*.mp4)’ as the suitable one for Yoga tablet as the supported information mentioned above. Click the “Effect” button to open the Video Edit window to achieve editing MP4 like trim, crop, image, watermark, effect, subtitles and rotate and etc in the corresponding editing pane. 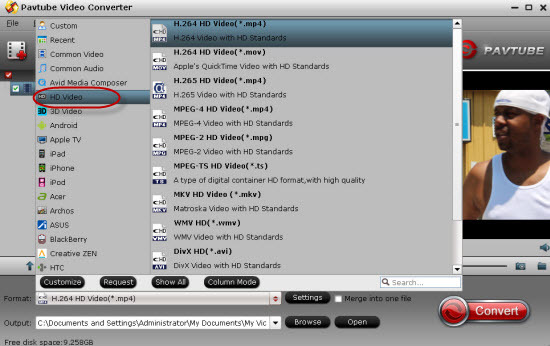 Click the “Setting…” button to open the Advanced Settings window to adjust the output video codec, resolution, bitrates, frame rate, aspect ratio, audio codec, channel, volume and etc in the advanced tab. Go back to the main interface if you have done all the preparation work there. Hit the ‘Convert’ button, we can make this conversion job started! In a word, with this guide on how to add any videos to Lenovo Yoga Tablet 2, we are so glad to enjoy movies on this 8-inch screen tablet! Do you wanna join us for more? How to Play MP4 on Samsung Galaxy S4/S3/S2/Tab/Note/Ace?